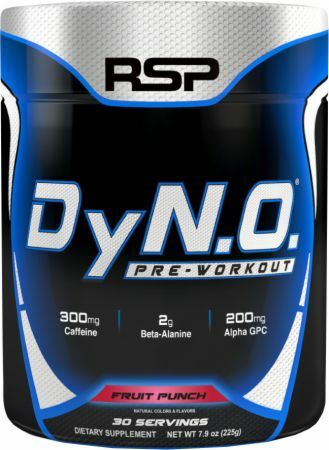 DyNO by RSP Nutrition at Bodybuilding.com - Best Prices on DyNO! The Most Comprehensive Pre-Workout. PERIOD. 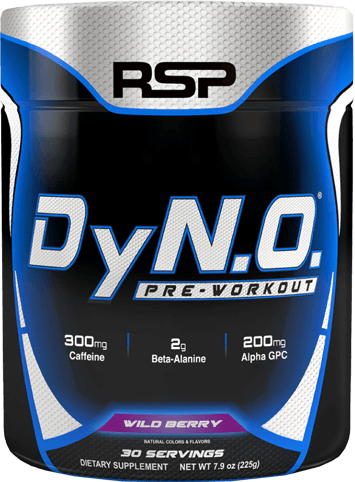 For a limited time, buy 1 DyNO, 30 Servings & get 1 50% OFF! L-Arginine Alpha Ketoglutarate, L-Taurine, Choline Bitartrate, Citrus Aurantium, and BioPerine Black Pepper Fruit Extract. This tastes really good and it helps me push through my workout. Definitely top five preworkouts I have tried in a long time. It doesn’t leave me feeling crashed and it’s pretty gradual. I have been using tangos for the past month. I actually really enjoy this preworkout. Nice pumps and no dumps. Great pre w/o. No jitters just a boost that really helps wake me up before my workouts after work. This is an excellent pre workout. I love the beta alanine kick and tingle during my sets. No cliff dive come down afterwards. The lemonade flavor has no aftertaste like some other brands flavors. First off, I have never taken this supplement alone. I stack it with RSP Pump Boost. I was taking fast fuel (also by RSP) and this stuff is a huge step up from fast fuel! And fast fuel was great as it is! My energy is insane. No jitters or crash. The flavor is on the upper average side. Not bad by any means, but not all that great either. I plan on using this on super heavy days and fast fuel on the lesser days. I don't want that crazy energy when not needed. I have been taking this preworkout for about a week now. Its been great, noticed a lot more sweat (i'm in the tropics weather) despite air-conditioning at the gym being at full blast and not many people being around the gym. Started with 3/4 scoop and am slowly building my way up to 1 scoop eventually (to test my caffeine tolerance). Now I am in between 3/4 and a full scoop. The main observations are: no noticeable jitters, my heart rate felt normal (even watch monitoring), more sweating than my previous preworkout. I have read the warning labels on this product and after thinking through I have gone ahead to take this preworkout despite a heart condition (that is not induced by caffeine, but had to be on the safe side) and safe to say it's all good so far. Great source for an energy boost, helps me finish those last sets during a longer workout. Love the added focus I have while I’m using DyNO, no crash afterwards is a bonus. Very powerful preworkout, not a ton of ingredients but still does the trick! Gives me energy and focus within minutes and lasts throughout my workout. 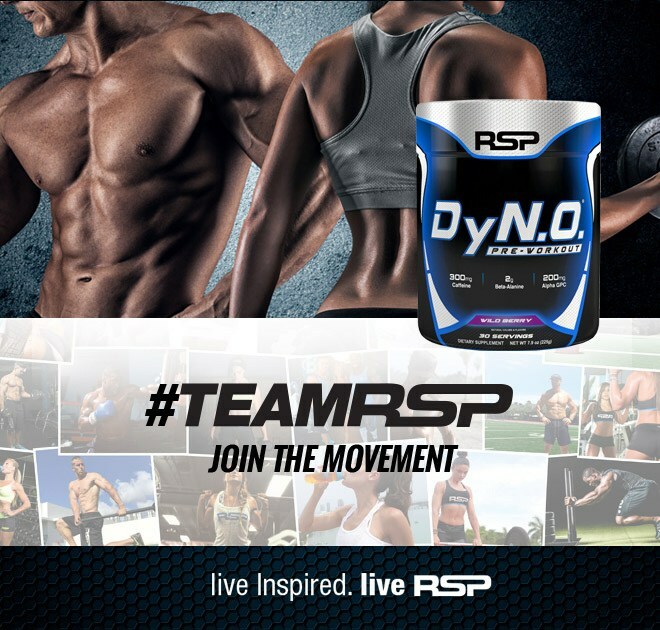 For an added bonus use the RSP Amino 5000 product during your workout to further increase effects and results! This pre workout gives me amazing pumps! I absolutely recommend it! * Percent Daily Values are based on a 2,000 calorie diet. **Daily Value not established. Natural Flavors, Citric Acid, Sucralose, Silicon Dioxide, Beet Root (for color), Acesulfame Potassium. Directions For DyNO: Mix one scoop with 6-10 oz of cold water and consume 15-30 minutes before training. Do not exceed more than one scoop. Warnings: Not intended for use by persons under age 18. Do not exceed recommended dose. Do not consume synephrine or caffeine from other sources, including but not limited to, coffee, tea, soda and other dietary supplements or medications containing phenylephrine or caffeine. Contains 200 mg of natural caffeine. Do not use for more than 8 weeks. Consult with your physician prior to use if you are pregnant or nursing, or if you are taking medication, including but not limited to MAOI inhibitors, antidepressants, aspirin, non steroidal anti-inflammatory drugs or products containing phylephrine, ephedrine, pseudoephedrine, or other stimulants. Consult your physician prior to use if you have a medical condition, including but not limited to, heart, liver, kidney, or thyroid disease, psychiatric or epileptic disorders, difficulty urinating, diabetes, high blood pressure, cardiac arrhythmia, recurrent headaches, enlarged prostate or glaucoma. Discontinue 2 weeks prior to surgery or if you experience rapid heart beat, dizziness, severe headache or shortness of breath. Keep out of reach of small children.